Confirming Supreme Court nominee Neil Gorsuch to the Supreme Court has been President Trump's top legal victory so far, but a number of broader battles await. Photo by Andrew Harnik, courtesy of AP Images. Fifth part of a series. The Trump administration's legal maneuverings and attempts to begin unraveling regulations during its first 100 days have set the stage for what are likely to be prolonged, fierce battles in environmental law over the next four years. The administration has mostly tried to get its bearing in a host of environmental legal disputes pending in various federal courts. Early skirmishes with environmentalists have centered on its requests to halt litigation as it figures out what to do with Obama-era policies. "Obviously the chess pieces on the board have radically changed, and clearly the wagons have circled around our prize pieces," said Bill Snape, senior counsel at the Center for Biological Diversity. "We're in defensive mode, no doubt." What does the first 100 days of President Trump's term mean for the next four years? 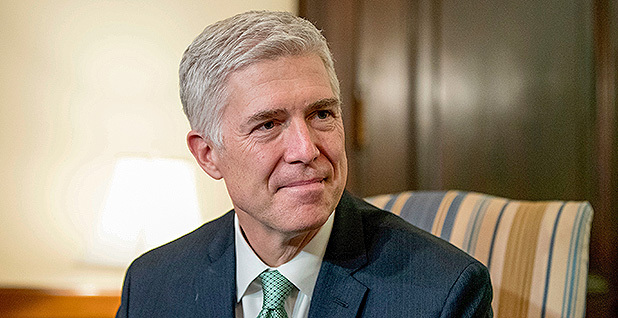 President Trump notched an early victory this month in the confirmation of Justice Neil Gorsuch to the Supreme Court over the objections of most Senate Democrats. Gorsuch restored the court's conservative wing, filling the seat left vacant since the February 2016 death of Justice Antonin Scalia. While Gorsuch won't have a huge impact on environmental law in the short term, he'll move the court in a direction likely to be more skeptical of environmental regulation and deference to agencies. The biggest court battles, observers say, will come when the administration actually begins eliminating rules or issuing revised versions. "There's not much they can do to stop the administration at this point," said Jim Rubin, an attorney at Dorsey & Whitney LLP and formerly of the Justice Department. "The opposition will become a much more significant thing when the agency chooses to change the rule. A lot of these cases will be repeal without replace," he said. "That's where you're going to have real opposition." Over the past 100 days, federal agencies have filed a flurry of motions to put on ice pending litigation in federal courts. With the exception of the Supreme Court’s decision to continue hearing a case over which federal court has jurisdiction to hear challenges to the Obama administration's Clean Water Rule, federal courts have so far granted the motions. Lower courts, for example, granted requests to pause lawsuits over the 2015 ozone standard, curbs on power plant wastewater discharges, an Arkansas regional haze rule, critical habitat guidelines, and a rule intended to reduce air pollution during industrial plant startups, shutdowns and malfunctions. At the last minute, a federal court also delayed oral arguments over the Obama administration's landmark hydraulic fracturing regulations. The administration has pending motions in litigation over U.S. EPA's carbon dioxide curbs for new power plants, methane limits for new oil and gas operations, the agency's cost-benefit analysis for power plant mercury regulations, and greenhouse gas standards for trucks. In some instances, the court requests have provided the first hint that the administration is considering changing an Obama rule. Environmentalists have roundly objected to the motions. "They're trying to weasel their way out of any court decision that might affirm the scientific integrity and the wise policy of Obama legacy rules," said Patrick Gallagher, director of the Sierra Club's Environmental Law Program. While the motions have led to a lot of back-and-forth briefs over the past few weeks, legal experts said that the administration's actions aren't all that surprising. The Obama administration similarly asked courts to pause lawsuits over President George W. Bush-era environmental regulations, including standards aimed at addressing cross-state air pollution, because it thought they were too weak. "I think what we've seen is a page out of the Obama playbook," said Jeffrey Holmstead, a partner at the firm Bracewell LLP and a former EPA air official. "The Obama administration, when they came into office, didn't want to defend some of the rules that had been issued by the Bush administration." To be sure, the Trump team hasn't flip-flopped on all Obama positions in the courts. In the Supreme Court, the Justice Department has defended, for example, President Obama's critical habitat designation for the polar bear — even as it successfully asked a lower court to stay litigation over broader habitat rules. The new administration has also defended the Obama rule setting renewable fuel standards for the years 2014-2016. The RFS rule "really doesn't fit the pattern of the others," Rubin said, because support for biofuels crosses partisan lines. And the Justice Department is fighting a court order requiring it to submit by July 1 an evaluation of job losses tied to air regulations in a lawsuit brought by the coal industry against the Obama administration. It hasn't, though, fought to appeal an earlier court order that didn't set such a tight deadline. What hasn't happened yet over the past 100 days: Any indication from the U.S. Court of Appeals for the District of Columbia Circuit on the fate of litigation over the Clean Power Plan, which aimed to lower carbon dioxide emissions from existing power plants. As with other Obama rules, the Trump administration has asked the D.C. Circuit to hold the case in abeyance. But the litigation was further along than others; the full court heard nearly seven hours of oral arguments in September. "As a matter of course, the courts have always given a lot of deference to administrations," Holmstead said. "The only one that is somewhat unusual is the Clean Power Plan case because it has been fully briefed and argued by an en banc court. I think that's really the only case where there's any question whether the courts will basically let the Trump folks revisit the rules." Environmentalists and state supporters of the Clean Power Plan have urged the court to still issue an advisory opinion that would guide EPA in its efforts to undo the rule. But the Trump administration says issuing a ruling now could threaten the "integrity of the administrative process." As EPA under new leadership works to figure out what to do with greenhouse gas regulations, the last 100 days have showed the lasting impact of the 2007 Supreme Court decision in Massachusetts v. EPA, legal experts said. That 5-4 decision established that EPA has the authority to regulate greenhouse gas emissions under the Clean Air Act. Following that decision, the courts upheld the Obama administration's endangerment finding, which provided the basis for future greenhouse gas regulations. Massachusetts v. EPA "clearly means that the administration can't simply say we're going to ignore climate change," said Michael Gerrard, director of Columbia University's Sabin Center for Climate Change Law. "That decision, plus the court's upholding of the endangerment finding, means there is now solid authority that EPA needs to act on greenhouse gas emissions," he said. "It means they will at least have to pay lip service to the importance of regulating greenhouse gases." Opposing motions to pause litigation is only "Step 1" in environmentalists' strategy to combat the Trump administration in court, Gallagher of the Sierra Club said. "Step 1(b), we're gearing up to challenge any fake rulemaking they come up with," he said. "Step 2, we're aggressively seeking information on corruption, conflicts of interest within the administration through the Freedom of Information Act." In the first 100 days of the Trump presidency, the Sierra Club and Natural Resources Defense Council have already filed about a half-dozen lawsuits against the administration. The Center for Biological Diversity has been more active, filing 11 suits. Among the most recent: a complaint against Trump's border wall plans that invoked the National Environmental Policy Act. Then there's a lawsuit targeting a Congressional Review Act resolution that struck down a regulation setting limits on how certain animals can be killed in national wildlife refuges in Alaska. "It's just all-out war," said Patrick Parenteau, an environmental law professor at Vermont Law School. Going forward, Parenteau predicted that "fiendishly complicated" regulations like the Clean Power Plan and Clean Water Rule will likely pose the most trouble for the Trump administration in court. Over the next four years, Parenteau said the courts will act as "process cops," ensuring that rulemaking efforts are backed by a strong record and that the administration doesn't prejudge outcomes. The Reagan administration provides a lesson in how courts can be a reality check against sloppy, rushed rulemaking, he said. "The courts looked very skeptically at these rushed efforts of the new administration to repeal and roll back environmental rules from a prior administration," Parenteau said. "That isn't to say that they won't win something or that the courts are envisioning themselves as putting a brake on the new administration, but I think the courts are definitely going to look very hard at efforts to roll things back." Environmentalists expressed confidence in their ability to fight to push back against the agenda Trump has rolled out in the past 100 days. "Trump has way over-promised," CBD's Snape said. "It just seems to me, logically, that he's going to lose a lot more in court than he's going to win." Rubin predicted that, aside from rule rollbacks, mandatory statutory requirements and deadlines contained in environmental laws will provide "an angle for litigants to sue." Court orders could become important in forcing agencies to take actions that they otherwise would not. "Once you're under a consent decree, you have to act," he said. "EPA does not want to be held in violation of a court order." In those types of cases, the Obama administration was criticized for "sue and settle." Republicans accused agencies like EPA of inviting litigation from friendly groups so that it could turn around and negotiate settlements. Avi Garbow, who served as general counsel at EPA during the Obama administration, denounced the idea that EPA invited lawsuits and predicted that Trump's Justice Department would likely seek to settle similar cases involving deadlines and other "clear instructions" from Congress. "It has historically been very difficult for the Justice Department to find a winning defense on liability in these sorts of mandatory duty cases," Garbow said. "There are times when the Justice Department determines that it is in the public's interest to resolve matters through settlement." Garbow also warned that the administration's proposals in the last three months to limit the budgets of federal agencies could hamper their ability to take legally defensible actions in the future. EPA, which would see a 31 percent cut under the administration's budget proposal, already has a tough time keeping up with the statutory mandates in environmental laws, he said. "Without the ability to manage its own resources in a way that allows it to operate in timely compliance with the laws' mandates," Garbow said, "EPA may in effect turn over the reins of its priority setting and rulemaking to outside litigants." Trump acts fast to strike rules — but what's the long-term impact?